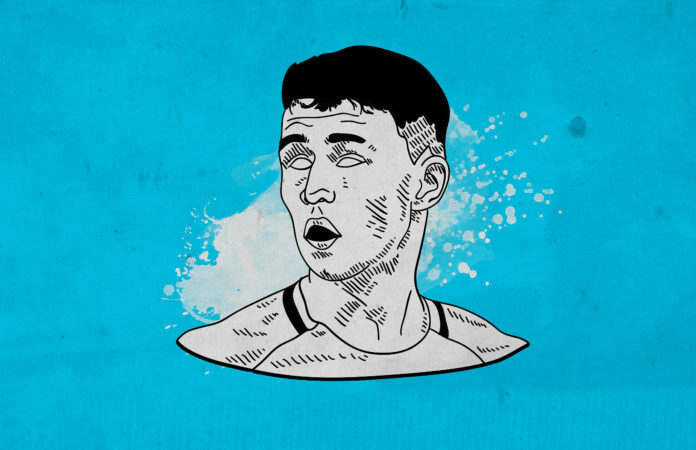 Tactical Analysis: Phil Foden, the "Stockport Iniesta"
Being a young player at a big club is not easy. It’s even truer at Manchester City where all positions are covered twice (almost three times) and where the bench still contains world-class quality. Almost 10 years on from Mansour’s takeover, not one English player from City’s academy made a Premier League or Champions League appearance last season. Phil Foden is the exception. He has been at Manchester City since the age of nine. Now 17, the young midfielder has been promoted to the first team after excelling for the U18s last term. 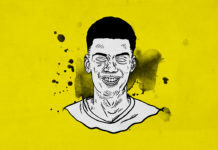 He also was the star man for England under 17s as the Three Lions made history by winning the FIFA U17 World Cup for the first time in the country’s history in 2017. His two goals in the competition’s final secured the trophy as he emerged the golden ball winner as the tournament’s best player. Phil Foden has developed as an offensive midfielder with a preference for the leads. Some fans already name him the ‘Stockport Iniesta’ in reference to his hometown. Indeed, there are a lot of similarities between the Barcelona player and the young Englishman. Firstly he is a playmaker. Either in youth competitions or in elite games, he always has the adaptability to lead the game thanks to very good qualities with and without the ball. He scores and provides assists in the same quantities, the mark of top players, being decisive whatever his position on the field. Phil Foden is very fast and smart. Here he oriented his body to be ready to get the ball and move forward quickly. Like Iniesta, he is also a dribbler thanks to an incredible left foot. Moreover, he has a particular physique. He is quite thin for a player reaching such a level (even more for the Premier League) and boasts excellent stamina and maximum speed. Although his apparent lack of toughness can be seen as a weakness, he protects the ball well and is so rarely dispossessed. On the field, he played most of the time in the midfield, either behind the striker as a number 10 or a bit on the right side. 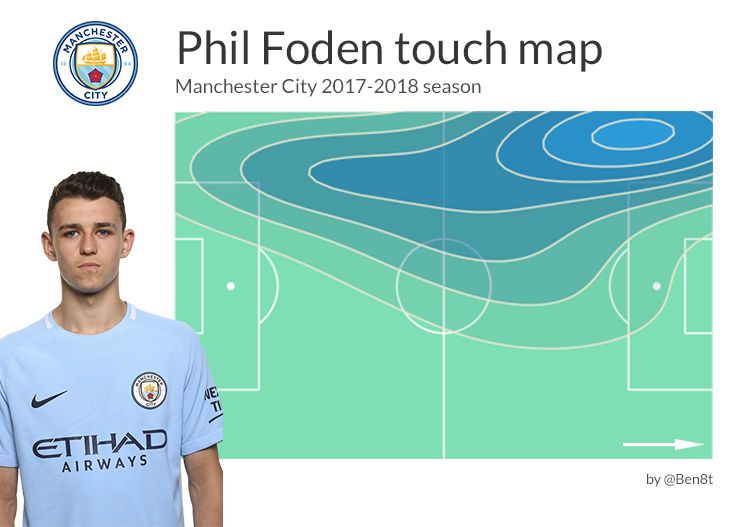 However, when Pep Guardiola called him up to play with the first team to play Premier League games (he played a total of 43 minutes last season and already eight minutes this season), he used him on the left side of the attack as we can see on the touch map below. In fact, it is not his habit to play a lot of young players but recent declarations show how Phil Foden and Guardiola have a good relationship. That is why he opted to go on City’s tour instead of playing for the England U19 team this summer. With Guardiola in charge, Foden may just develop into another world-class superstar reminiscent of Xavi or Iniesta. 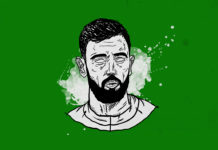 One tough obstacle for Foden is that there are a lot of players higher in the hierarchy, not to mention Riyad Mahrez’s arrival this summer. However, there are some elements in favour of the young Englishman. Firstly he is a homegrown graduate in a club which definitely needs that kind of player. Currently the Premier League allows a maximum of 17 non-homegrown players in each 25-man club squad. This means that in a full squad, there must be at least eight homegrown players. Therefore Foden is likely to stay in the plans of management, at least for this reason. With a busy club schedule, he will also have more playing time as David Silva gradually leaves his place little by little. Phil Foden is the perfect substitute for the Spaniard, who recently retired from international duties. 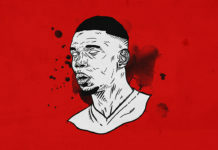 But like Daniel Sturridge or Kieran Trippier before, the young talent could be forced to leave Manchester if he doesn’t earn more playing time. This is the downside of the influx of cash and the arrivals of big stars. Previous articleSantiago Arzamendia: Paraguay’s Future Flying Full Back?